I just did a check on my blog archive. 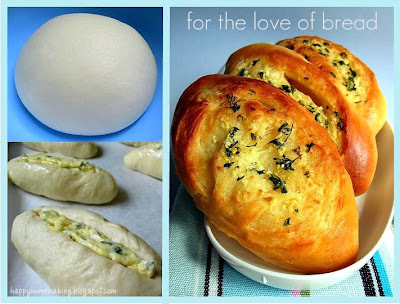 I am so surprised to know that it was 9 months ago since I last made bread buns! Ever since my younger boy developed this 'special liking' for square sandwich bread, I have been making loaves after loaves of breads. I finally got to make some Garlic Buns a few days back. I picked up this recipe as it yields only 6 buns, which is just right for us since we are down to the three of us for the next couple of weeks. From the photo, these tasty buns look almost like mini baguettes with a hard crisp crust. In reality, they taste just like soft dinner rolls. Flatten each dough into a round disc. Roll up Swiss roll style and pinch the seams in place. Roll the dough on work surface to shape it into a longish oval shape or torpedo shape. Place doughs seams side down on a baking tray, lined with parchment paper. Loosely cover with a damp cloth or cling wrap and let dough proof for 30mins. Prepare filling by mixing butter, garlic and parsley to form a smooth paste. Brush each dough with egg wash. With a sharp knife, make a slit lengthwise on each dough. Pipe fillings on each slit. I like your 2nd picture, top left corner, love to see the dough proof to this stage. Yes, with the electricity bill going up, I've also not proof my bread in the oven full time, I usually warm up the oven for 10 mins at 40 degrees then leave it inside to use the remaining temperature to proof the dough. Seems like you're using several recipes from the book :) It's indeed a worthy book to get! Your garlic buns are so delicious. I have a bread machine too I find that it does not knead long enough. I see you knead the dough second time. Will the machine get over heated? Mine is Sanyo brand. wow nice looking buns! i haven't been doing good with breads lately, although i've been baking, i didn't blog about it. lately, the dough just simple gets too sticky, not sure if it's due to under kneading? Hi Elyn, yes I love the dough after the first proofing! It looks so smooth and round that I didn't even have the heart to punch it down ;) Yes, I will try out a few other recipes from this book, the small portions are just like for us. Hi Michelle, yes the bread machine will not knead that well. I usually let my machine knead for 20mins (stand time) and another further 10mins. I do a pane test around 8mins (while the machine is still running)to check, most of the time I am quite satisfied with the result...although it may not fully pass the pane test. My bread machine doesnt get over heated, as I have tried running it for 40mins of kneading. I think Sanyo should be a good brand, as mine is a cheap housebrand from Carrefour. Yuri, if you are following the measurements closely, and the dough is still sticky, then it is probably due to under kneading. You will have to knead the dough until it no longer sticks to your hand...that is, your hand should be clean with no bits of doughs sticking onto your palms and fingers. I usually need to take about 30mins of continuous hand kneadning to reach that stage. This is esepcially so for making asian type of soft breads. oh these buns look so good!! thank you for posting them!! Oh, u do window-pane test after 8 mins? Perhaps I could try letting the machine run for another 10 minutes... to be honest, i'm getting frustrated with bread making due to all these failures :( but have to keep trying to get it right, right? the buns look wonderful!! i wish i had one now! Hi Yuri, Michelle, I think I wasn't clear on my earlier comments...I meant to say I do the pane test during the 2nd kneading cycle...ie after 28mins of continuous kneading. If the dough seems ok, I will stop the machine after the dough has been kneaded for 30mins. Hope I didnt confuse any of u.
Hi, nice to meet you, too. This bread looks great, and I think the taste will be great too, and it goes into my must try recipe now. Hi HHB,Just a suggestion to those who using bread machine to knead, try using ice water instead,that goes the same with eggs, milk, do not add butter untill mixture turn into smooth elastic dough. The bread looks yummy, wish i can just reach out to my monitor and grab one! Thanks for posting the recipe... will try it out one day. I also hv problems making slits on the dough... it's just so difficult and the bread turned out really ugly after baked! LOL. hmm so funny. I made this and instead of using 2 cloves of garlic, I used 8 because I thought a "clove" of garlic was the entire garlic. so it was so garlic-y. but the bread that wasn't so close to the garlic was so good. haha. I was wondering, do you have a recipe for 湯圓？Because I've always wanted to make them. Heh. Sorry it's so unrelated. Hi Mushiio, oh dear, it must be very spicy with so much garlic? I'm sorry I do not have any recipe for 湯圓...but I think you can search around other food bloggers, I am sure you can find something. Those look delicious! I'm a sucker for bread and garlic together. Hi HHB, I've read the book and watched the DVD and got a better understand esp on the kneading part and passing the pane test. Hi SSB, yes the dough was not sticky anymore after 30mins of kneading. Close to 20mins of kneading, the dough should no longer stick to the bread machine pan and you will hear the dough banging away inside the pan during the last 25-30th mins of kneadning. Of course if your hands are not lightly dusted with flour, the dough will feel sticky. However, when you do the pane test, it should pass it...although sometimes I still let the dough pass even if the holes did not have a smooth edge. I finally tried out this awesome recipe. It was fantastic and I love it. 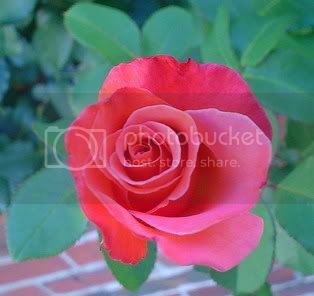 I have posted it on my blog and have linked you. Hope you don't mind without first asking ur permission. Thanks for sharing the recipe. i really reading your blog and i love your breads and wonderful pictures!! thanks to your sharing, I borrowed the book and learnt so much from it. pls keep your wonderful blog going! would you tell me which recipe is this adapted from? I'm struggling with the chinese words! !thank you so much! for SSB: i suspect that for your breadmaker, 40 min of kneading might have "overkneaded" the dough. at 40 min, if the dough is not stretchable at all and looks dimply, it's overkneaded. try testing the dough at 20 min and 30 min, like what HHB said. I put my dough through 60 min of breadmaker kneading once - at 40 min it looked ok, but after anohter 20 min the dough totally became unstretchable and had tiny strands of broken down gluten. still edible after baking, but the texture was not good. hi Alisha, thanks so much for the widgets, they are great!!! Hi Canton Pixie, I'm sorry I can't remember the actual Chinese name of the recipe...but you can refer to the photo...mine is quite similar to the one in the book. Yes, 60mins is way too long! The dough will be over-kneaded. I usually give only 30mins of kneading. Love garlic bread...this I got to try. I've tried making bread from aunty yochana's blog but wasn't quite satisfied with the texture. I do not have a bread machine, so I was kneading by hand all the way. May I know if i still follow the same instructions? Also, my dough always seems quite "yellow". Can't seem to get the nice white-ish colour you had in your pic =( any idea why? Hi You Fei, you may look at my previous post "Matcha Red Bean Loaf" as I have shown how I knead by hand. To knead by hand, I usually mix all the dry ingredients in a mixing bowl (including the instant yeast), then make a well in the centre, and add in the wet ingredients (milk/water or eggs). Mix to form a soft dough. Transfer to work surface and knead by hand. When it becomes smooth (about 5 mins or so) knead in the butter. I usually take about 20mins or more to knead the dough till smooth and elastic. Yes, initially the dough will be a sticky mess, but as you knead it will become very smooth. It's kind of hard to explain in words how to do the pane test. Maybe u can google and see whether there is any photos to illustrate this? Thanks so much! it definitely gave me a better idea..another qn..may sound stupid though..after kneading in the butter, to make it smooth and elastic, do you actually have to flour your work surface quite a bit? Hi You Fei, no worries :) After kneading in the butter, you dont have to flour the work surface, just continue to knead and the dough will become smooth. In fact, try to refrain dusting your work surface with flour. It helps if you could use a dough scraper...you can scape up the sticky dough and knead along. "To perform the window pane test, you pinch off some dough, roll it into a ball shape, and then start stretching it. You should be able to stretch it far enough that you can see light through it without the dough tearing." "It should be elastic, almost rubbery, and pull away into a thin membrane." You can also take a look at this photo (http://www.flickr.com/photos/malcolm_wing/261771461/). Take note that the edges of the holes should be smooth. Hope you find this useful. Hi You Fei, these buns should yield soft crust. May I ask did u cover the dough during the 1st proof as well as after shaping? I read that if left uncovered, the crust will be harden after baking. after shaping always loosely cover bread dough with cling wrap or a slightly damp (not wet) tea towel. hmm..i covered my dough with cling wrap for the first proofing.. for subsequent proffing (i.e. after shaping) i didnt really cover them well..maybe that's the cause.. do i jus put a wet tea towel over? won't the towel touch the buns? or is it supposed to be like tt? thanks so much anyway! especially your very detailed replies =)) i'll give it a shot again soon and let you know! Hi You Fei, you will need to cover the bread dough even after shaping. Use a slightly damp tea towel not a wet one. You can read this site for further details (http://www.baking911.com/bread/101_rise.htm). So far I have been using cling wrap to cover the dough during the second proofing. If I am making buns and I have to use a baking tray, I'll cover them loosely with the cling wrap, otherwise the dough may not have space to expand. I'm sure with a few more practice, you will be able to make soft and fluffy breads too! 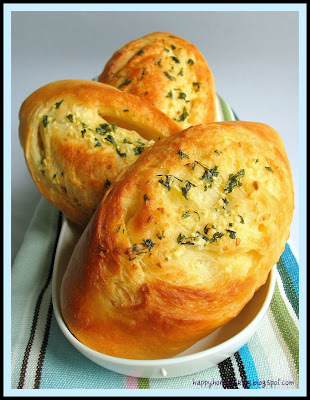 hi,you r doing a great job.i want to make garlic-buns.can i use simple flour to make buns.here in pakistan not different types of flour available easily.waiting for your reply. Hi Yasmin, I am not sure about using another type of flour for breadmaking. I always use bread flour which has a higher gluten. If you really cannot find high gluten flour, you can try use plain flour, however you may not get greater volume and better texture. However, if you are making pizza or even focaccia, you can use plain flour. hi, tried this recipe. quite nice fragance of garlic. hope to link up with everyone, thanks. Thank You for those buns- they are sooo delicious and soft! hello! yr breads really look very yummy! im new at baking bread. is the butter used for piping salted or unsalted? thanks! Hi Mickaela, I used salted butter for the piping. Hi, I made this last weekend and it was finished up during the day!! Will make more for future bakes! Thanks for the recipes! Mouth watering article. u know these days i have gone crazy behind garlic. i mean i am liking it in any form , and apart from this garlic has so many other benefits too. Garlic is considered one of the oldest medicines in the world and is used in making remedies for various ailments and physiological disorders. Garlic is one of the most effective antimicrobial herbs, as it has anti-bacterial, anti-fungal, anti-viral, anthelmintic and antiseptic properties.Consuming large amounts of garlic can cause heartburn, especially during pregnancy. If left in contact with skin of mucous membranes, fresh garlic can also cause local irritation and ulceration. Hi HHB, your garlic bread so tempting and I just can't wait to try. I have all the ingredients at home except the "cake flour" - is it self raising flour? Thank u so much for sharing this recipe. Dear HHB, can't wait to send u this report. My garlic bread just came out from the oven minutes ago and now we are enjoying it. It turned out so perfectly, so delicious, crispy outside and soft inside. The taste were great, instead of parsley, I use oregano. I would give a 5 star to this wonderful recipe. I made just exactly 6 pcs enuff for 6 of us. 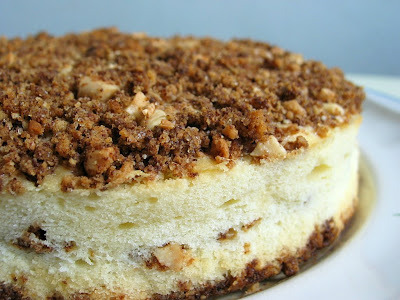 Earlier planned was to bake this for 2morro's b'fast. But the poor garlic bread can't even take their first breath..lol. When it comes to making bread, I have to think twice about kneading since I don't have BM. But this recipe was so perfect, I didn't have any problem at all, no sticky2 problem, even doing the pane test was so easy. The slit was a bit too deep, no problem at all as my knife was a bit sharp. Once again, thank you very much, burrppp!!! Your breads look amazing. I am so glad I found your site. When you have milk as an ingredient, you show the measurement as gram. Should it be as ml? I live in the USA and have a scale which also measures metric. Do I measure it in a measuring cup as ml or weigh it on a scale in grams? Not sure if these measurements are interchangeable. Thanks. Magnificent blog, spectacular food photography, kitchen skills and recipes.